People sure do love their Aladdin. 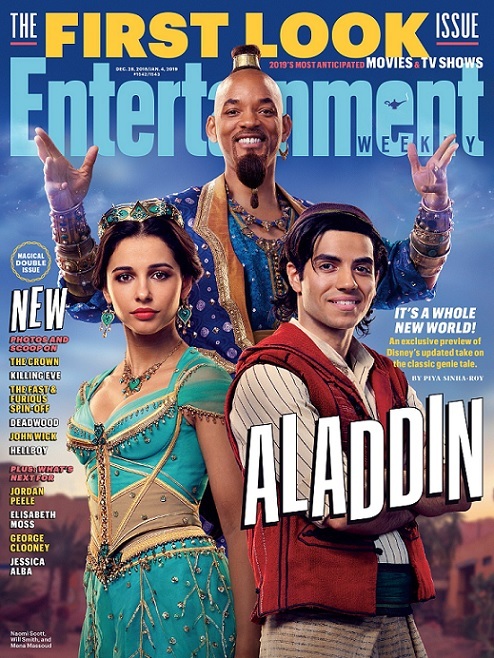 Entertainment Weekly tweeted out its cover this past week, which features the cast of Disney’s live-action Aladdin including Mena Massoud (Aladdin), Naomi Scott (Princess Jasmine) and Will Smith, who will be playing the Genie. Right away people took to the streets, aka the internet, to voice their disapproval that Smith’s Genie was not blue. So great was the backlash that Smith was compelled to go on Instagram to clarify that Genie would indeed be blue in the movie. Smith said that his appearance on the EW cover was Genie’s form when disguised as a human. Unfortunately the negative remarks didn’t stop there. From the look of the characters to the questionable costumes, Aladdin is facing an uphill battle. Even before this, Aladdin has received criticism for adding a new original white character, Prince Anders, to be played by Billy Magnussen. People have called the move unnecessary and labeled it as another example of whitewashing the movie. Earlier this year there were reports that the white extras were being applied brown make-up during filming in order to “blend in”. That went over as well as you’d expect and you had to wonder what they were thinking? But let’s be honest, it’s going to make a ton of money regardless. Disney has gone all in on the live-action remakes of their beloved animated features. Alice in Wonderland, Beauty and the Beast, Cinderella, Christopher Robin and The Jungle Book have all performed well at the box office, fueling Disney’s desire to remake even more of their library. In reality, audiences are becoming more and more critical, giving remakes less room for approval. Stray too far from the source material and you’re ruining what people liked about it in the first place. Keep things close to the source material and you’re accused of being bland and not taking creative chances. Besides Aladdin, which has gotten the most backlash of all the remakes to date, we have Dumbo, The Lion King, Mulan, Maleficent II, Pinocchio, Prince Charming, Jungle Book 2, Cruella, Lady and the Tramp, Sword in the Stone, Tink, Peter Pan, The Little Mermaid, and Snow White, at some place in production to look forward to. What many don’t know is 5 years from now Disney will start remaking their live-action remakes as animated remakes, bringing it to a full circle.